Travelling from London to Chelmsford by train is fast and easy. See how to get there, what train to take, on which platform and what to look out for. See train times and get your train tickets. Book hotels in Chelmsford too. Ask questions. We are here to help make your journey a smooth one. Are you looking for Chelmsford trains? You can travel from London to Chelmsford in Essex by taking a train from London Liverpool Street Station, or London Stratford station straight to the City of Chelmsford (Chelmsford became a city in 2012). Chelmsford is the county town of Essex, located just 31 miles North East of London. If you want to travel from London to Chelmsford by train, it is only 29 minutes from Stratford Train Station in East London, or as mentioned already, 32 to 40 minutes from central London Liverpool Street Station, depending on whether you are boarding a fast non stop train from Liverpool station to Chelmsford or a slow train that stops at almost every station station along the way. London Liverpool Street Station to Chelmsford Station by train. Journey time and stops on a slow train. So wherever you are in London, just take a bus or train to London Liverpool Street Station. 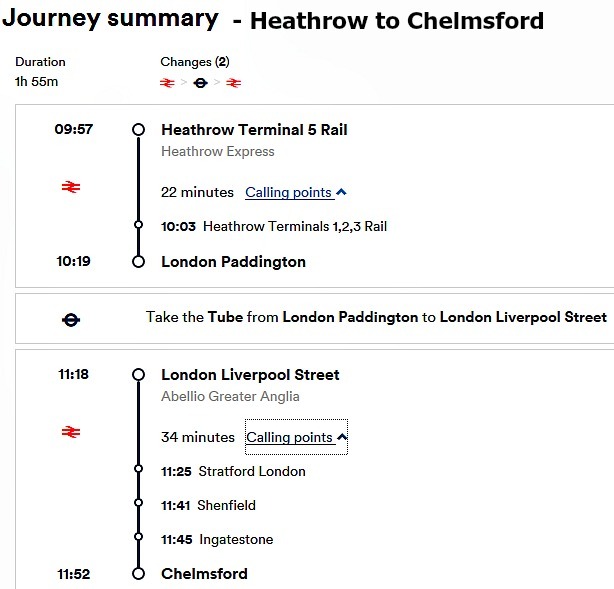 Go to platforms 8 to 18 and you will see a train going to Chelmsford. 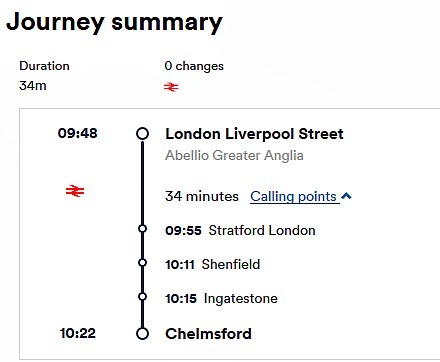 This route is usually plied by Abellio Greater Anglia Trains. Be sure to take a train that stops in Chelmsford en-route any of those destinations. Not all trains stop in Chelmsford!! If you are leaving from East London, you can take the London underground to Leyton (on the Central Line) and stop at Stratford Station. Jubilee line, district line and the Dockland Light Rail (DLR) also stop in Stratford. You can then go over to platform 10 (often, though this could change) and get a train from Stratford in London to Chelmsford Essex. This rail line stops in Romford too. Yes. You can get a direct line from Romford to Chelmsford. Are you coming to Chelmsford from outside the UK? The quickest route to Chelmsford from London Heathrow airport is to take the special Heathrow Express train to London Paddington Station. From London paddington Station, you now take the London Underground line to London Liverpool Station and from there to Chelmsford. This would involve two stops. It would take you about an hour and fifty minutes. Take the Piccadilly Line train (on the London Underground services) from Heathrow airport going into London - East bound (often going to Cockfoster as it's destination). You can get this train from any terminal (terminals 1 to 5 at Heathrow). Look out to stop and change train at Holborn train station. This is about the 20th stop from Heathrow. Alight here and change into the Central Line Train (also part of the London Underground trains). You will need to take the East Bound Train to the London Liverpool Street Station. This is about five stops from Holborn. Once in Liverpool Street Station, you need to look out for the "over ground trains". Go to platforms 8 to 18 and look for a train going to Chelmsford. The whole journey from London Heathrow Airport to Chelmsford will take you about 1hour 50 minutes to 3 hours, depending on the time of your travel and trainline you choose. Train fares from Heathrow to Chelmsford costs about £45 one way (single), or for a open return, valid for 28 calendar days, cost of ticket is £57.50 (you can use this ticket for your return journey and save about £13 if you are traveling back to Heathrow within the next 28 days). These prices could change any time, but it gives a fair estimate as at of August 2016. If you use our Trainline Fare Finder, you may be able to get a one way ticket for as low as £18.50 or within that region, depending on when you are travelling from London to Chelmsford. Buy cheap train tickets to Chelmsford in advance here and save up to 70% on standard train ticket price, compared to your buying the same ticket from a train station on the day of travel. Just type in your start off point and then your destination (in this case, that would be Chelmsford or CHM for short), into the search box below. You can also check available train times and price real time by using this search box. Chelmsford is a vibrant city with an area of about 130 square miles, and a population of over 180,000. It is a university town, home to the famous Anglia Ruskin University, with superb shopping centres, Cathedral and beautiful county side villages around it. The river Chelmer passes through the town centre, adding to the natural beauty of this picturesque town, with boats easy seen along its banks. It has been a county town as far back as the 11th century, and it is only 25 minutes drive from Colchester, the oldest Roman settlement in the England. Broomfield Hospital Chelmsford, Springfield Medical Centre Chelmsford (Springfield Hospital Chelmsford) and The Priory Chelmsford are among the health facilities in this town. Chelmsford is also home to top hotels and bed and breakfast lodges. For hotels in Chelmsford, use this search box here and get cheap Chelmsford Hotels. Are you visiting Chelmsford for business or leisure? Whatever brings you from London to Chelmsford or from anywhere in the world to Chelmsford, we hope you have a great time in Chelmsford! Are you planning to visit Chelmsford in Essex, UK? Wondering how to get to Chelmsford by train from Heathrow Airport or from anywhere else in the UK? Or just have a comment or great idea to contribute? Share it! Post your thoughts here. Have your say. Return to homepage from London to Chelmsford by Train Page.